The date may look like a marketing ploy for a blockbuster movie or convention date for numerologists, but it represents one of the most important recent events in Los Angeles history. That October morning, the city hosted its first CicLAvia, meandering through a series of closed off streets between East Hollywood and Boyle Heights. No one knew what to expect, but thousands showed up lured by the prospect of exploring the city at a more human scale and subsequently changing our views on how we use our streets. More recently, there is an upcoming Ciclavia in the San Fernando Valley this Sunday, March 22 starting at 9:00am. With that in mind, we wanted to provide a little background to get you familiar with the event, and maybe even spark you to go check it out. On average CicLAvias attract around 100,000 people. Yes, that’s a lot. It crosses the lines between every age group bringing in participants from all parts of L.A. County and even beyond. The event is traced from the ciclovía events started in Bogotá, Colombia forty years ago. Frustrated with gripping traffic and smog concerns, leaders threw their hands in the air and decided to close down miles of streets to all vehicular traffic. Initially, there was some resistance, but now it is a weekly event bringing 2 million people out to 80 miles of closed streets. 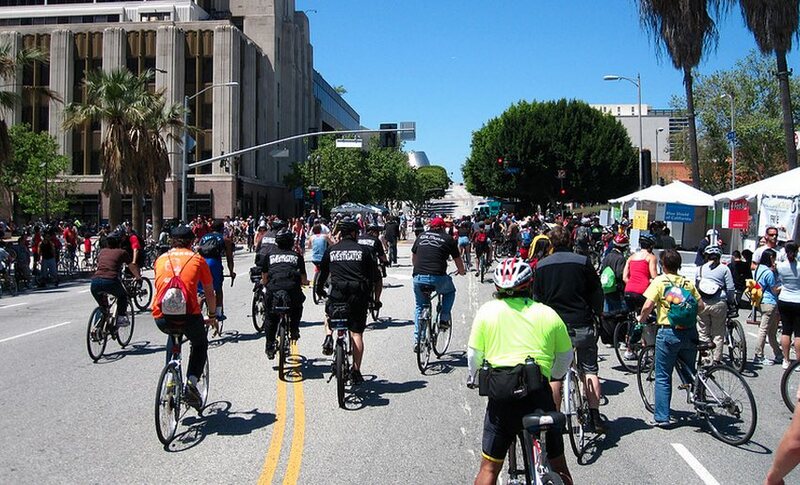 As the seeds were planned for our first open streets event in 2008, it took a giant collaboration between Mayor Antonio Villaraigosa and many city departments to get CicLAvia off the ground. Two years later, the event took hold and was such an instant success that talk for the next event started immediately. Los Angeles is known for its car culture, but the city originally grew in a more pedestrian manner. Streetcars used to rule the land until the freeway flattened out our urban landscape out. In that time, we learned to zip by neighborhoods without ever experiencing them. Open street events can take place anywhere in the country, but CicLAvia helps many rediscover communities that have been overlooked. We’ve already been to places like Echo Park, East LA, the Arts District, Leimert Park and Chinatown, with many other discoveries to come. Just because the name implies cycling, CicLAvia engages more than those who ride bikes. Runners, walkers, rollerbladers and all other forms of human powered activity are allowed to use the streets as they please. That includes dancing, parading, picnicking or taking your dog on a stroll(on a leash please). There’s no starting point and no need to train either. Cyclists move at a near pedestrian pace to absorb everything in front of them. That means you have a lot of freedom and far less rules than Fight Club. You’ll see people dressed in costumes, carrying boom boxes, playing games and other things that’ll catch your eye. But most of all, the common denominator is everyone carries a smile. One study conducted by the UCLA Luskin School of Public Affairs showed that sales have increased an average of 10% for businesses along CicLAvia routes. Even more impressive, is that business have increased 57% for those that have engaged with the event. Proprietors are allowed to move out onto the sidewalk (as long as they provide four feet of passage) able to peddle their wares to passers by. Anecdotally, completing a CicLAvia course out and back will take less than two hours, leaving people with nothing but time to discover what many of the stores and eateries have to offer. Some savvy businesses have realized that even though they may not make more sales that day, to use the opportunity to engage thousands of potential customers they would never have this personal interaction with. Of course, there are examples of business that won’t benefit from a CicLAavia event (a gas station is going to suffer on a day of an event obviously). Also, if a local business had a conflicting initiative or event they’d previously scheduled before CicLAvia for was announced for their area, this could be cause for concern as well. However with some foresight, raised awareness, and careful planning, situations like this can and should be avoided, and on the whole, we see CicLAvia as a good thing for local business communities. CicLAvias are more than being a celebration of all things Los Angeles. It educates us how to use our city better through walking, cycling and transit. 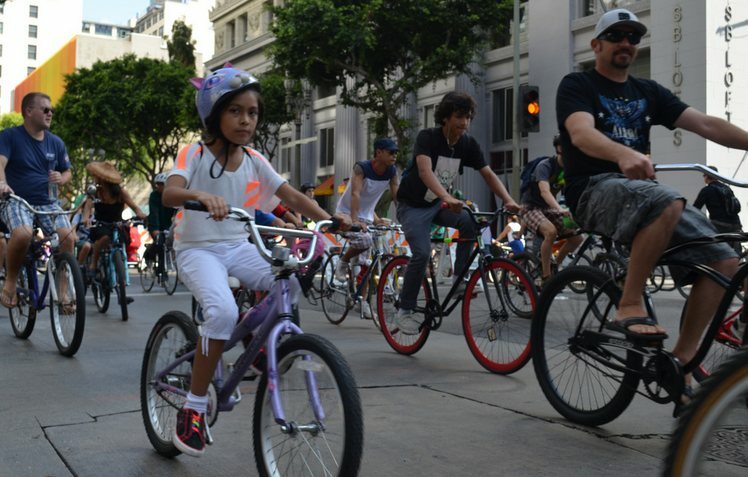 Metro provided $2.35 million to CicLAvia for these open streets events encouraging many to get around without a car as every incarnation has been accessible by Metro Rail. For some, it may be the first time taking public transportation discovering that going by bus or train can be easier and cheaper than driving. In 2015 alone, CicLAvias are expanding to Pasadena, Culver City and the San Fernando Valley, giving exposure to places some Angelenos may not have ventured yet. With miles of bike lanes added yearly, streets becoming more pedestrian friendly and experience a growing public transportation network, Los Angeles is returning to its people centric roots from over a lifetime ago. CicLAvias are playing an important role defining our urban fabric for the remainder of the 21st century. All you have to do is roll with it. What’s your take on CicLAvia? Have you been? What was your experience? Let us know in the comments below! Zachary Rynew has touched Los Angeles in many ways. For years he helped visualize many of the city’s major projects (LA Live, Hollywood Blvd., Metro Rail, UCLA) and had his work featured at the Getty. He was a winner at the LA Improv Comedy Festival and ran in five LA Marathons. Now, he travels the city by bike and couples his local knowledge with his sports writing experience to bring you a different look at the blurs we normally pass by.